Dr. Sherrill Blodget enjoys teaching and performing, and strongly believes in the power of music to inspire students and audiences alike. She is thrilled to be a part of Castleton’s growing music department! As Director of Choral Activities and head of applied vocal studies at Castleton, Blodget directs the University Chorale and Castleton Chamber Singers, teaches voice, conducting, and global music, and is vocal director for musical theater productions. She is also advisor to the Castleton Student ACDA Chapter, and Vocal Unrest. 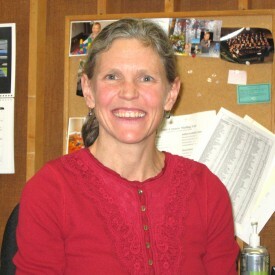 In addition to her work at the University, Dr. Blodget is active as an adjudicator, clinician and guest conductor in Vermont and surrounding states, and is Membership Chair and Past-President of the Vermont American Choral Directors Association (ACDA) and the Vermont representative on the National Board of the National Collegiate Choral Organization (NCCO). Prior to joining the Castleton family in 2008, Dr. Blodget directed high school choral and vocal programs, and university, community, and church choirs in Arizona, Vermont, New York, Massachusetts, Colorado, Oregon, and Pennsylvania. She has worked with a wide spectrum of ensembles including early music, women’s, men’s, and mixed ensembles, Blodget has a particular interest in Latin American Baroque Choral music. Her research and preparation of a critical edition of Los Maitines de Nuestra Señora de la Concepción, by Mexican composer Ignacio de Jerusalem (1707-1769), enabled the premier East Coast performance by the Castleton University Chorale in 2010. Blodget earned her D.M.A. in choral conducting (orchestral conducting minor) from the University of Arizona; M.M. in choral conducting from the University of Oregon; M.M. in music education from the Pennsylvania State University; and B.A. in music from Yale University. When not involved in making music, Blodget loves to hike, x-country ski, swim, and explore Vermont and the Adirondacks with her two young sons and husband.